Francine Rosenberg is a clinical psychologist in private practice specializing in the treatment of anxiety disorders and obsessive-compulsive disorders.Playing with your hair and picking at your skin are usually harmless habits. But for many people, these bad habits become irresistible urges that seem impossible to control. This presentation will help you equip your patients with the necessary tools to reduce their body focused repetitive behaviors. This program is approved for 1 CE credit. The cost of a CE Certificate is $15 for NJPA members, $25 for non-members, and free for sustaining members. You will be provided a link after the program for the evaluation. 2. Recite the four steps in Habit Reversal Training. 3. List the five modalities of the Comprehensive behavioral Model (ComB). 4. Discuss the differences between Habit Reversal Training and the ComB Method. Contact: Mike Zito, PhD at [email protected] or 908-753-8696 if you have any questions or prefer not to register online. Please register online by Monday, April 8, 2019 at www.mcpanj.com. (Location is ADA accessible.) Americans with Disabilities Act accommodations are available upon request. Requests must be made at least 14 days prior to the event. Please contact Mike Zito, PhD for more details. This program is co-sponsored by NJPA and the Morris County Psychological Association. 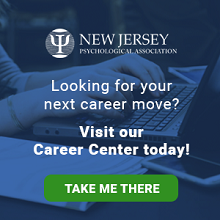 NJPA is approved by the American Psychological Association to sponsor continuing education for psychologists. NJPA maintains responsibility for this program and its content. NJPA ensures that permission to use proprietary information, and steps to safeguard such information, are discussed with presenters at NJPA sponsored programs. No materials (physical or electronic) provided to attendees at such programs may be shared.